Today is my son’s 14th birthday. 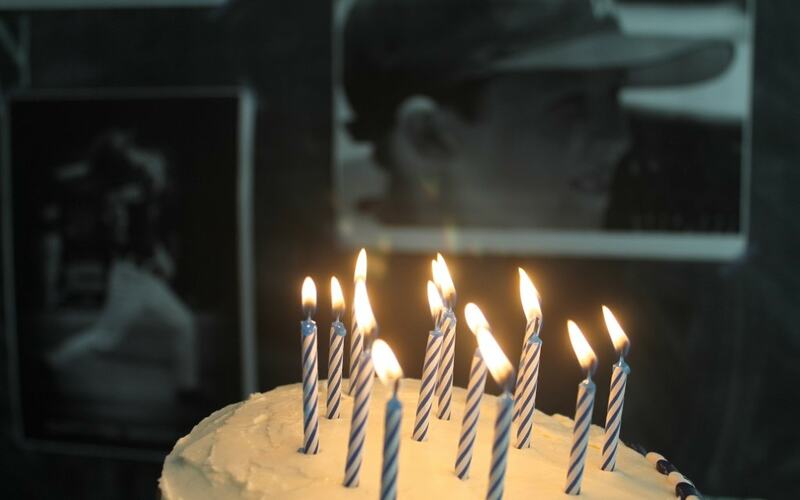 He was born at the perfect time of year for someone with a profound passion for baseball….watching, playing…everything baseball. He’s a huge Yankees fan and by the 14th year of coming up with original baseball themed celebrations, I was starting to run out of ideas. 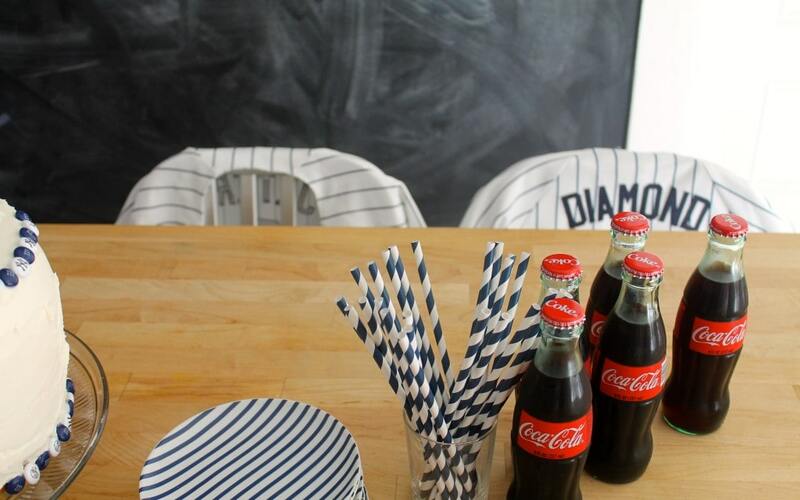 So this year, the theme is “Pinstripes.” It’s amazing how easy it is to work around a theme once you have it, everything from straws to cake to washi tape to plates and candles…all blue and white pinstripes…for the New York Yankees, of course! 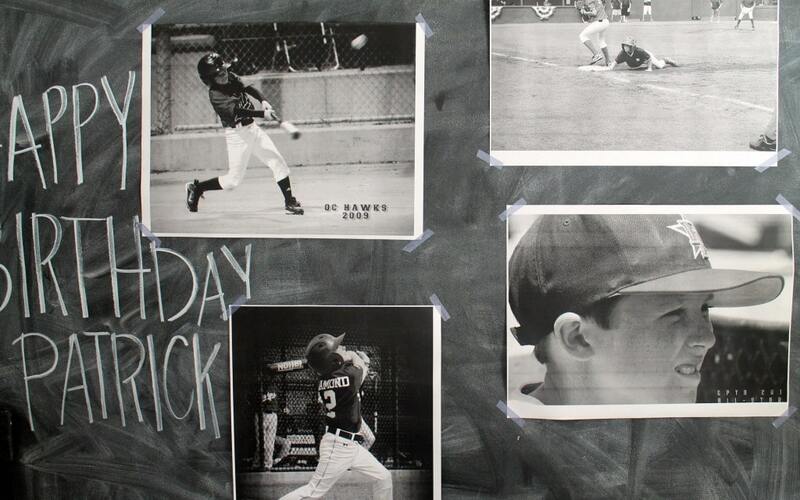 I have been wanting to try the engineer prints from Staples for a while…I chose a few from over the years of Patrick’s young baseball career and had them made all for around $10. A few weeks ago, Paula of Two Ellie made them for for her son’s 6th birthday and went with the even larger size. I think I’ll try that next time…check her darling party out here. Hold on to your hat lady. I remember 14 like it was yesterday and now my twins are 20. What a wonderful cake and party. Please wish your son Patrick a Happy Birthday from pve. I’m sure I’ll get an :eye roll: back. Sweetest Birthday ever! 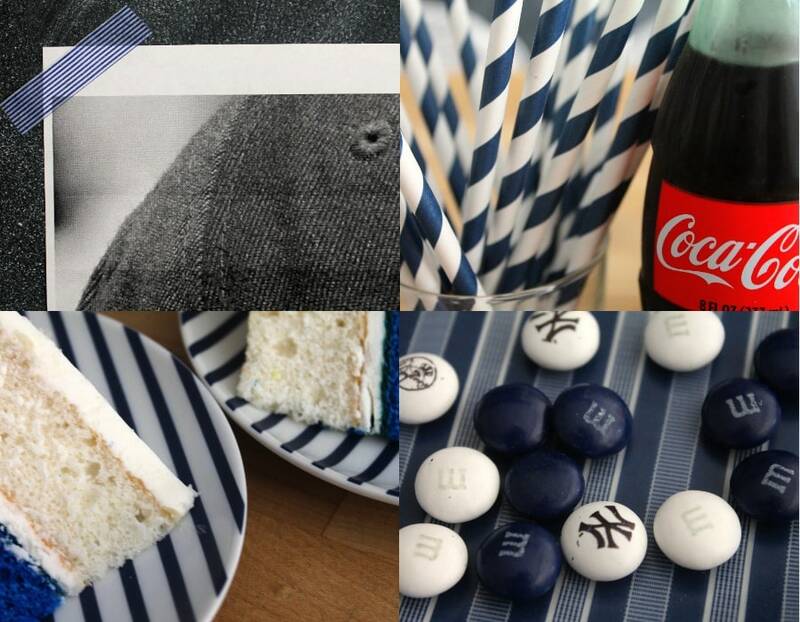 You had me at blue & white pinstripe… Swoon! Happy Birthday Patrick :))) please tell me where those blue & white plates are from? I NEED them in my life . Thank you. I found them a few years ago on the “back table” at west elm for $ .99! Do you rent out your services as the perfect mother?? These Birthday Party Photos are to be cherished! “Pinstripe” clever theme… cake, plates and candles! The best! Happy birthday and go Patrick!! I love the theme, such a beautiful celebration! Happy birthday, Patrick! What an amazing party!!! Looks like so much fun. What a great party!!! Love your style and the M&M’s. 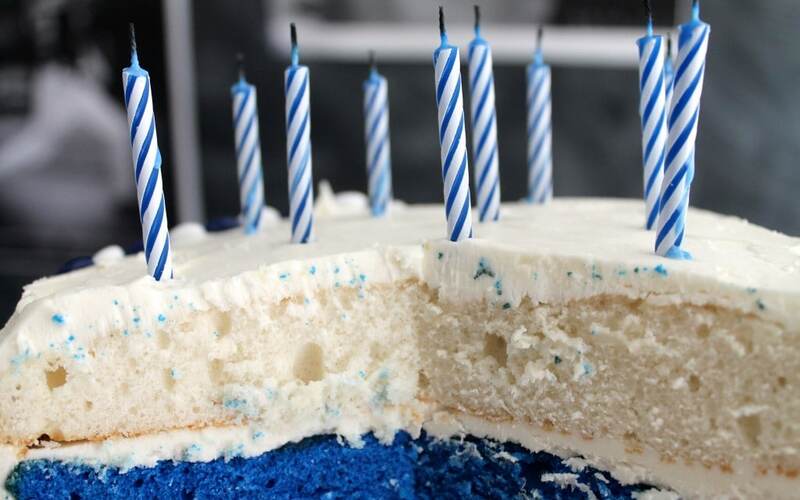 So clever…and how did you get that cake layer so blue? How Special for Patrick. Happy Birthday Patrick! What a great party! Happy Birthday to your son! Love your blog!!!! 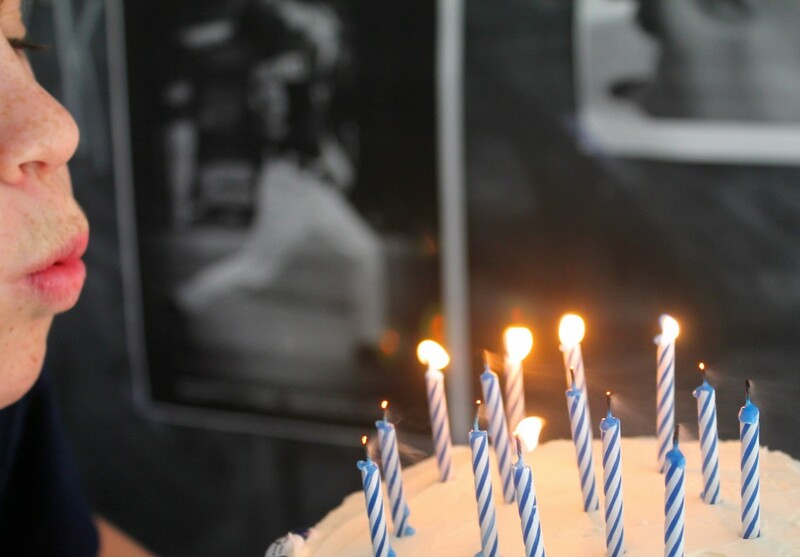 The birthday party was so cute and I adore the pictures from Staples. I read their web site for the engineer prints, did you take in photos of your son and were they color or black and white photos, I was kind of confused and would like to try it. Thank you!!! Mickey Also love the paper straws!!!! I uploaded the photos at home to the staples website and selected the size, paid and they were ready for pick up a couple of hours later. Three of the photos were color, one black and white, but the engineer prints are all b & w. Hope this helps. Happy belated birthday to Patrick. Once again, you blow me away! I’m sure he had the perfect day.